We have camps in various locations throughout the year lasting from 1-5 days. Dates and Rock Stars in attendance vary. Please visit our website for the latest info. BRIEF CAMP DESCRIPTION: You on Stage with Rock Stars! 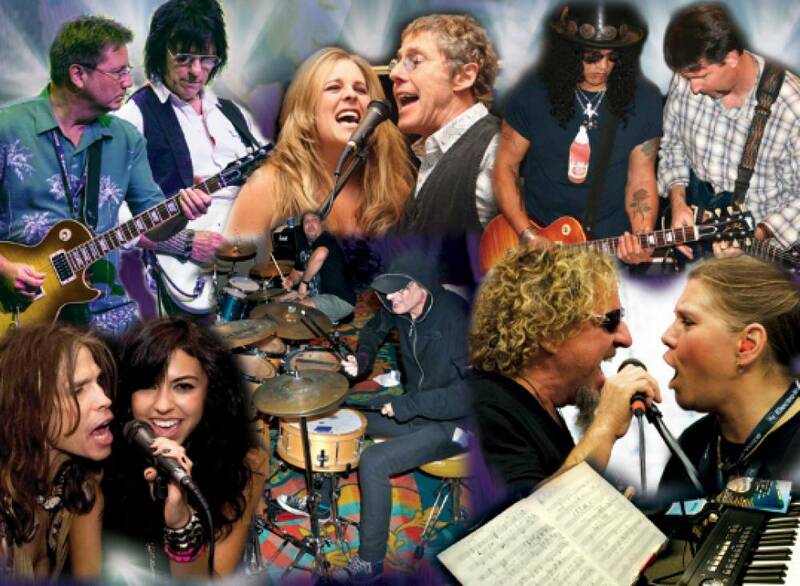 Jam, Rehearse, Write, Record and Perform with the World's Greatest Rock Stars! As a participant in a Rock and Roll Fantasy Camp™ 4 Day Destination Camp, you'll be placed in a band with a Rock Star counselor, learn or perfect your knowledge of an instrument, write, record and perform an original song with your band, get schooled by Rock and Roll's greatest talents, and perform live on stage at a major venue in front of your family and friends! Most participants have some musical skills ranging from beginner, to intermediate to master. We will group you accordingly. We also offer a Young Rockers group for ages 12 -16. See our line-up of Rock Stars in our menu of upcoming camps on our website. CAMP LOCATION: We are located in the heart of Hollywood near Universal Studios and many other attractions. CAMP FACILITIES: Fully stocked with top of the line gear and instruments including Roland, Zildjian, DW, Remo, Fender, Gibson, Electro-Voice etc. The facility has been graced with the presence of Steve Tyler and other of similar caliber. CAMP PROGRAM INFO: As a participant in a Rock and Roll Fantasy Camp™, you'll get the rock and roll royal treatment! You'll live the rock n' roll lifestyle day and night, learning or perfecting your knowledge of an instrument, practicing and jamming with your band, and learning the ins and outs of the music business - all in the company of some serious Rock Stars! All musical levels are welcome from beginners to retirees. When you book a Rock and Roll Fantasy Camp™ Corporate Team-Building Program, your group will participate in a unique and cutting edge team building experience that engages them as they write and perform an original (well known) song about your company's product or service, values, goals and message. Your organization will be motivated and energized as they effortlessly gravitate away from problem-based thinking and move towards resolutions, success and an action-oriented mindset through the power of rock 'n' roll. The Rock 'n' Roll Fantasy Camp method delivers lasting results every time and is guaranteed to impact your company in the most memorable, innovative and creative way while having a ton of fun at the same time! These events can be held anywhere and be customized to your liking. No musical experience is required. • Campers are placed in a band with a rock star counselor for the entire duration of the camp. We place you in a band based on all of the information your provide upon registration - i.e. skill level, musical preferences etc. • You'll have the opportunity to learn from and jam with the other Rock Stars Counselors in the evenings during master classes and themed jam rooms. • Write and record an original song with your band! • Special guest and counselor-led master class sessions in drums, bass, guitar, songwriting, etc. CAMP LEADERSHIP CIT/LIT PROGRAMS: Our counselors have performed for huge crowds in worldwide arena tours and played on numerous gold records that you have played along with for years! CAMP SCHOLARSHIPS OR FINANCIAL ASSISTANCE: Payment plans are available - call our office to inquire. FAMILY CAMP SESSION(S): The camp is a perfect gift for the musicain in your life. YEAR-ROUND PROGRAMS: Check our website for the latest information. OTHER CAMP INFO: We pride ourselves on a non-competitive and encouraging enviornment.